Unseasonably mild but horribly wet to begin with today but it did brighten up for an hour before it went dark again. Today we hosted a group from the Poulton and Wyre Railway which is near Blackpool. They were participating in a special Drive a Diesel Railcar day with the Royal 2 car. They haven't started running trains and remind you of us around 10 years ago. Actually come to think of it, we have some space on one of our ordinary Bronze Drive a Diesel Experiences next Friday with DMU in the morning and the Class 25 in the afternoon. Our system has discounted it from £199 to just £109 so book online at www.e-v-r.com/experiences . 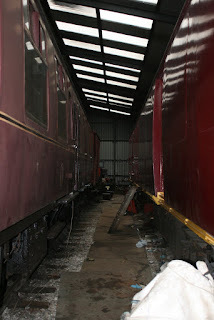 Down the yard Derek was cleaning window frames on the BSK and Ben popped down to continue the electrics. 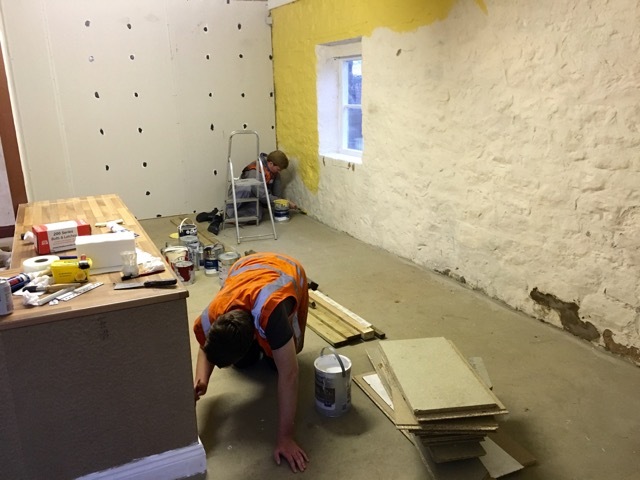 Big progress was made today on the site which will become the home to the mess room shortly. 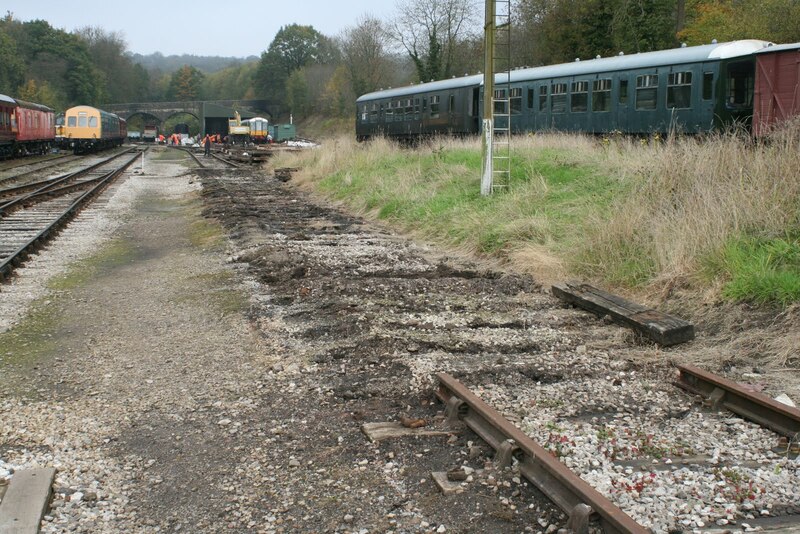 Remember the Mess Room is moving to allow the public proper access to the new Booking Office. A photo is attached of the cleared site. Some more work required next week though. 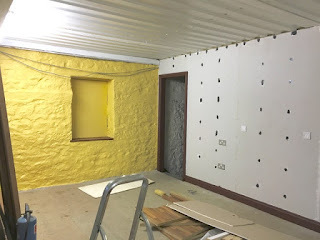 Inside the new Booking Office, a start was made on applying the new colour scheme to the walls. Much filling and priming took place in the morning and the new emulsion came out in the afternoon. Rather exciting and a transformation already! The images don't really do justice to it as it was already going dark when the pics were taken (it does that nowadays). One shows Nathan and Jon working away. 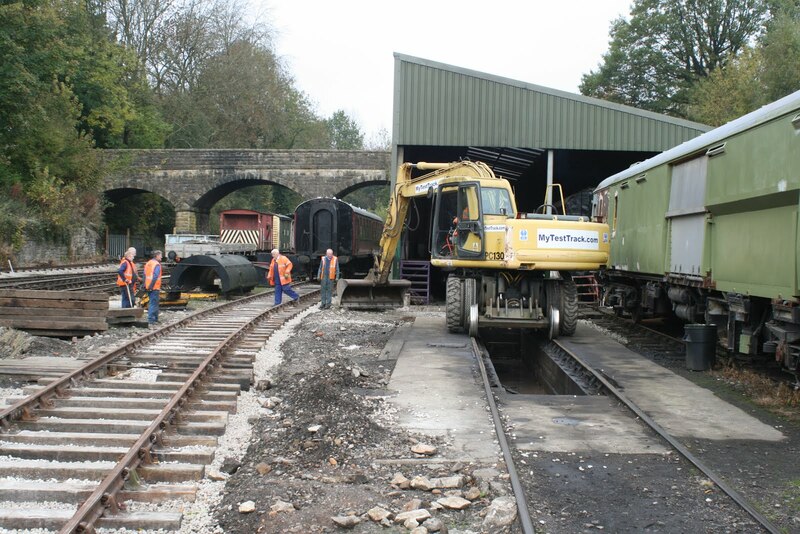 Back to normal life with a couple of pictures showing the where the track panels have been removed from road 3 and grading work near the pit as this area is tidied up after the completion of Taylor's Siding. I put a couple of video cameras around the Wirksworth quad with mixed results but I hope it has captured some of the atmosphere. May I on behalf of all the team involved thank everyone involved in ensuring we showed the Ecclesbourne Valley Railway in its best light for the visit. The planning over the last four weeks involved many pre visits by the Lord Lieutenant and his support team, Derbyshire and Metropolitan Police together with the Clarence House people. The plans were changed regularly resulting in a plethora of emails and telephone calls. Local farmers were assembled as the Prince had expressed a wish to show his support for the farming community and our two neighbouring schools were invited. The permanent way training company, ARC, were also asked to participate representing our links with work for the national network. Three options of rolling stock were offered and the Class 119 was chosen as the best available vehicle for the Prince to meet a selection of volunteers in small groups during the journey together with the attractive story that it was fully restored by a young group of enthusiasts. Much preparation and polishing of the two car unit was undertaken and care was taken to ensure the backdrop at Wirksworth Station looked good for the cameras and gave the public a view of the proceedings from Platform 2. Platform 1 was cleared of unnecessary eyesores and the children tastefully arranged to hide the crumbling Booking Hall which will shortly be history. Paint was applied to our other buildings. Eric, Helen and Anne catered on board with style and some difficulty during the journey ensuring the Prince's desire of tea with local honey was supplied. Access through the coach was somewhat crowded by the many press represented that attended. 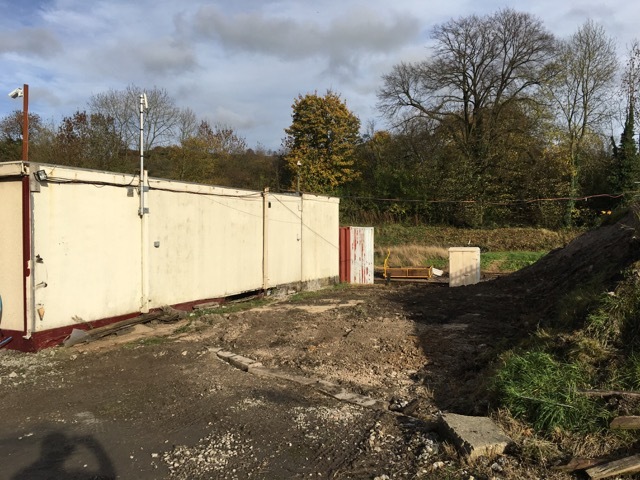 Evans, senior and junior, ensured our site was secure for the arrival of the Royal Bentley, Graham Arkwright and Rodney looked after Gorsey Bank and Idridgehay Crossing Gates for a non stop run and Ken Underhill ensured everything was under control at Duffield. Graham Walker and Tom Tait will have Royal Train Driver and Guard respectively added to their grade cards. It is difficult to think of anything to top this - wait, is that the White House on the phone! Following yesterday's exciting and successful Royal visit to Derbyshire's favourite branch line, Wirksworth station was a much more subdued place today. Volunteer fatigue may have played a part and I am very grateful to Eric Hills and John Evans who undertook additional operational duties to ensure we could run our scheduled Duffield service. Despite the inclement weather we did attract a fair number of visitors and played host to a troop of Crich Scouts who were undertaking a hike from the Stone Centre down to Wirksworth where a warm DMU welcomed them to take them onwards to Duffield and further challenges. Today's service was supported by the EVRA shop and model railway. The booking hall telephone rang with Santa bookings and the Pullman Buffet's homemade vegetable soup proved extremely popular as the temperature dropped. Down the yard Tim Oakes et al and the LMSCA could be found gainfully employed on their respective projects and two lonely, wet and weary members of the DMU team undertook a complex shunt to put everything back in its right place. HRH then travelled from Wirksworth to Duffield on our Award winning Class 119 W51073 and was introduced to volunteers who 15yrs ago began clearing the jungle which existed, and the DMU group who restored the 119 over a period of 5 yrs. 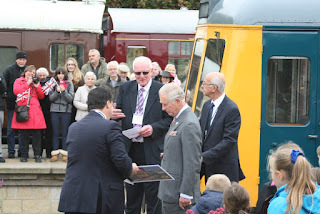 HRH also spoke to volunteers who rebuilt Shottle platform and restored coaches. My thanks go to all who helped to make this a successful and memorable day, including those in operational roles who were not able to see his HRH. All went well! A couple of photos taken by Nathan as an early taste of many more to follow. When the timetable was produced last Year we seemed to have made an error in the mid term school holiday date as it is next week, but we ran today and are not running next Wednesday. Not great numbers but we covered more than our expenses. The Pway team had a day of tidying the area around the Maintenance Facility. This sounds easy but involves the Kamatsu, wagons and many hands !! The DMU duo commenced tidying the site and washing the 119 railcar ready for Friday's visitor but someone being very particular decided it needed polishing to remove water marks. I wonder who that was !! 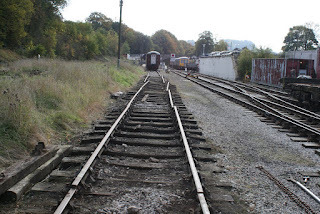 More track work at Wirksworth in connection with realighing Road 3 to facilitate the adjacent steam servicing road to be installed. The short ex Midland Railway 30ft panels are being recycled to extend the siding south of Wash Green to enhance the canted track area for our test customers. 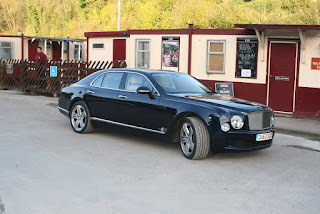 PS - a visit to the Churnet Valley Railway on Sunday saw a wedding take place in the building at Froghall followed by a reception on the train. I was taken by the presentation in their catering vehicle and the strange sounds emanating from the Polish tank engine. This is a forlorn test to see whether 4 versions of this are transmitted! However, this was the scene in the Maintenance Facility today where it is now time for our Mark 1 vehicles to occupy this space for repairs and painting. To the left is the BSK and to the right the dmu support coach. For the enthusiasts this is the first time the Facility has been occupied by two Mark 1 coaches simultaneously! We have Hong Kong trams from the tour of the World! In the new Booking Office, the masonry walls were filled with a sand and cement mix where necessary and are virtually ready for painting. The area above the fire exit was attended to, with the broken old Fire Exit sign being removed to allow for all the air conditioning holes to be filled up properly. The shunt mentioned yesterday took place with a lot of vehicles in the yard moving. Some of these vehicles had been in their storage locations quite a while so it's weird seeing other things in the their places. The shunt also featured the first vehicle's on Taylor's Siding too. Dan continued with the wagon refurbishment. For those who were wondering, this wagon has had the old wooden floor which was about rotten taken up and a lovely new steel one welded in. Much more durable for use with the Komastu bucket! Up the street many volunteers were putting a lot of hard work and effort into setting up for this weekend's Model Railway Exhibition. The show engulfs the town in many ways and takes up three halls in various places. 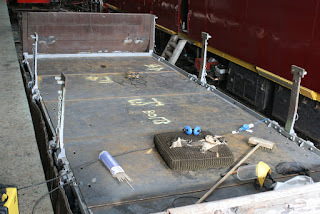 Work continued on stripping the BSK ready for the compartments to be spruced up ahead of the dining season next year. Our service today was ably handled by Iris and passenger loadings were reasonable considering the cool weather. Down the yard a start was made on tomorrows mega shunt. 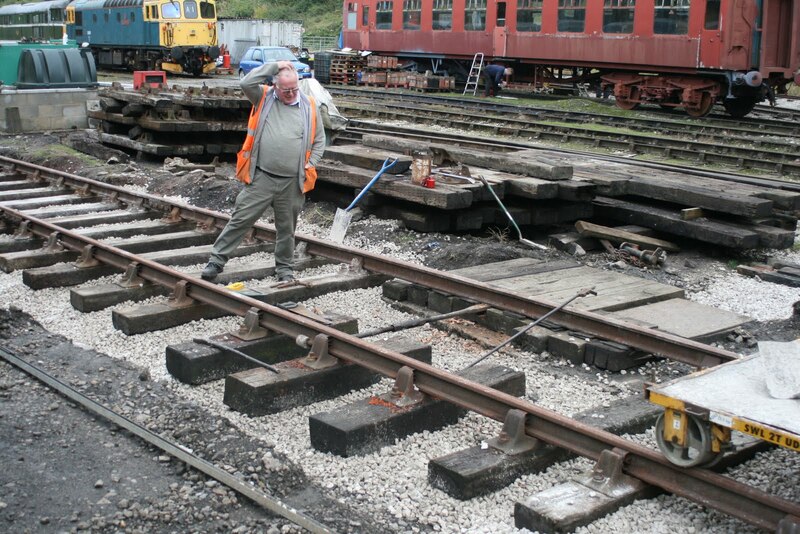 These shunts happen around once a year to get everything in the right positions for winter work to be carried out. It will also allow the PW team access to Road 3 to make the necessary alterations. 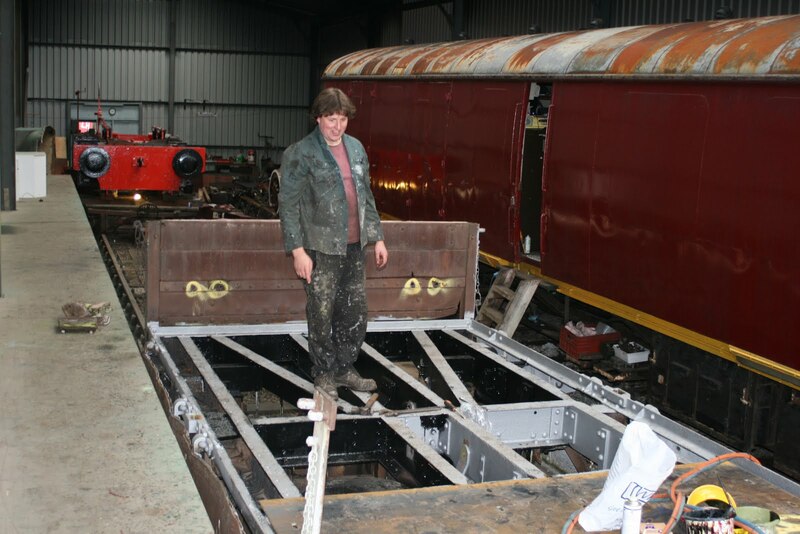 Dan continued on the wagon refurb too. The photograph is one taken in a sunny moment shortly after D7629 arrived yesterday. A trip to The Hannages was just too tempting!! First of all, apologies for multiple despatches yesterday resulting from a technology I don't fully understand! Trying again today, the photo welcomes D7629 to our Railway where the owner has been persuaded that it will be provided with a good and productive home. The Class 25s were regular performers on the Wirksworth branch as well as the Derby to Manchester locals. 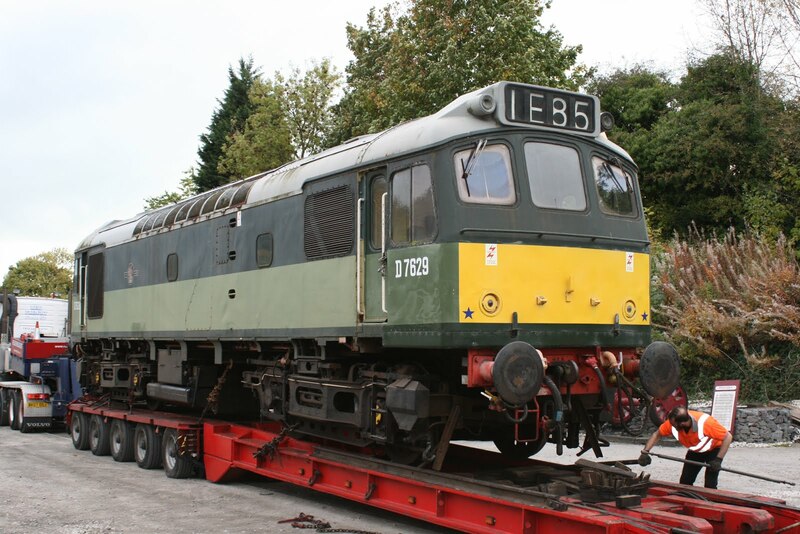 Our Class 33, Swordfish, departs tomorrow to take part in the Dartmoor Railway Polar Expresses but we hope to welcome it back in the New Year. The dmu team managed to replace a defective exhaust on 50253 and the LMSCA team continued with refurbishment of the GRAMPUS and stripping out the BSK. The PWT firstly went south to recover some sugar stone, a product of derailments some years ago, transferred this to north of Cromford Road bridge on the Incline. They then topped this off by white gold, ballast, to form a point at which our test vehicles can demonstrate they can on and off track at a maximum gradient. There is some finishing work to be done but we are on the way to keeping ahead of new requirements for our test vehicles. The Booking Hall continued to deal with the unceasing demand for the many opportunities our Railway is able to offer. 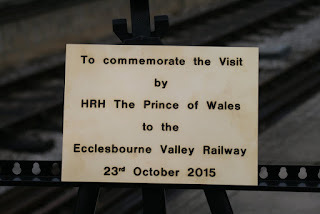 It is with some amazement and a great deal of pleasure I can announce that we have been selected to be part of HRH Prince of Wales tour of Derbyshire next Friday, 23rd October, and travel on our Royal Train from Wirksworth to Duffield. As you can imagine we have been hosts to a number secretive visits and we owe a debt of thanks to William Tucker, Lord Lieutenant of Derbyshire, for deeming us capable of welcoming such a distinguished visitor. As more details of the programme are released we will keep you advised of developments. You have to say its not bad to have the reputation that such a distinguished visitor can enter our world! A day that started cold and then became quite pleasant as we welcomed a pleasing number of passengers including a group of 40 who also sampled lunch in the Pullman. The service operated supported by the Booking Halls at Wirksworth and Duffield, the EVRA Shop and our catering team. The dmu team tended to the Class 119, recharged the batteries on the "Bubble Car" and had a general tidy up. The PWT declared Taylor's Siding fit for use after another session of jacking and packing. The DST cleaned Henry Ellison for the upcoming Model Railway Weekend and continued to winterise No3. The LMSCA in all its various forms continued with the refurbishment of a Grampus as illustrated, commenced stripping out four compartments of the BSK prior to renewal and achieved a new sliding door runner system on their BTO. This vehicle is benefiting from a faux tongue and grove effect as the Guards area is minimised to maximise the seating area. This again is rather poorly illustrated given the constraints of space! However, their plans for this and possibly the TO to have 2 + 1 seating will deliver some handsome dinning vehicles. 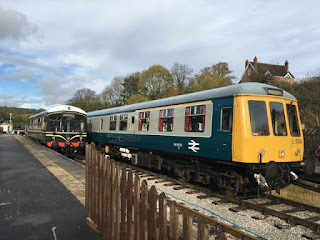 Yet another lovely autumnal day which saw us host one of the somewhat rarer Drive a Diesel Railcar days. The participants did two return trips and had lunch in the Pullman. As is customary for a Friday, much work was undertaken on the station. Team Tannery were in full flow and have now put up the remaining beams on the ceiling which the lighting will affix to. These have been painted to allow fixing to take place. It won't be long before preparation and painting of the walls takes place. Speaking of painting, Nathan painted 3/4 of the mess room's maroon portion and it looks much better. Further work in the beautification of the BSK's compartments took place and a myriad of Santa bookings were taken, including our first educational establishment of the season before the mail out has even taken place! Today's photographs show the new Booking Office at Wirksworth's progress so far. A sunny autumnal day with reasonable passenger numbers for the time of year. 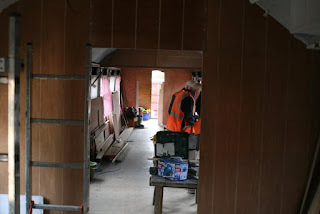 Much admin was done in the Booking Office whilst the coach team continued with work to spruce up the BSK compartments ready for next season's teas. 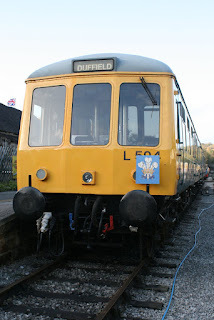 The DMU team had to change a fuel pump on 51505 which was good going in a day. It was good to welcome back LH after quite a period to provide the test facilities for a vehicle destined for the Tyne and Wear Metro. A photo of Dan, who is ever the perfectionist, as he refloor one of our Grampus's which are Permanent Way support vehicles. Dan is replacing the wooden timber floor with metal plates which will allow the Komatsu to unload material without destroying the flooring. He is ensuring the under is painted and that the end product will last years to come and it is great to see one of our wagon fleet receiving some tlc. 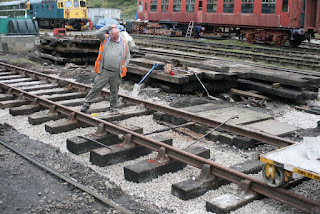 The second photo shows a visitor from Torrington puzzling over the "unique" solution to steering Taylor's siding over the perimeter of the oil separation pit. He wondered whether there was a Brunel influence? A short look at Willington formally known as Repton & Willington which illustrates, amongst other things, a Class 170 at full chat with exhausts that would do credit to an earlier era. You wouldn't even imagine it was October as we've been having a few glorious days! Yesterday the service was reasonably quiet but the season is starting to tail off a bit now. The DMU team gave Iris a thorough check over and also repaired the speedo drive on 51505. Dan continued plating the wagon he's working on. There was much station activity today with the hole which had come about through the wood being rotten on the back of the gents block being repaired and some paint being applied. Team Tannery put jointing tape on the walls and hung some of the beams which will eventually have the lighting affixed to them. Stuart had originally intended to try and tidy up the valances which form the canopy in front of the current Booking Office but the wood simply fell apart when he touched it so a start was made on taking it down. I suppose it's just the first part of the removal of the old Booking Office! They've been part of the furniture longer than I can remember though. After the Santa meeting this afternoon, we welcomed a party from Inside Track who went to Ravenstor and Duffield in the glorious late afternoon sunshine after taking tea in the Pullman.